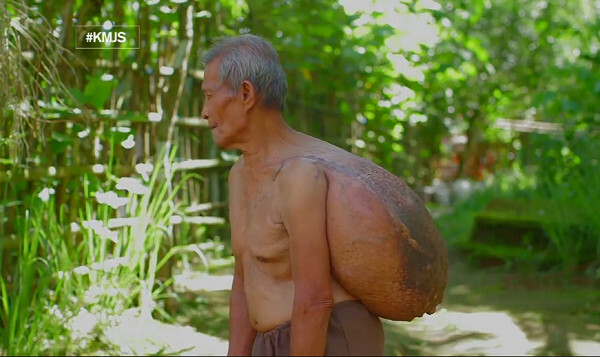 MANILA, Philippines – For 40 years now, Tatay Jesus de Mata has been carrying a heavy burden on his back, literally. There’s a huge cyst on his back that has grown so large and heavy that it is affecting how he moves around. Tatay Jesus lives with his wife, Florentina de Mata, at their humble home in Talisay, Camarines Norte. When he was younger, Tatay Jesus worked in a copra farm where he would carry sacks of copra on his back, walking around 1 kilometer with the heavy load on his back. Because he wanted to complete the work faster, he would actually carry the copra sacks even if the contents were still hot. He believes that this had somehow triggered the cyst that would grow on his back. At first, the cyst was small and unnoticeable, just about the size of a calamansi fruit. He went to the local health center and was prescribed some medicines which he diligently took but the lump did not go away. Because he had no money to seek medical help from professional doctors, he went to a faith healer or quack doctor. But because the quack doctor did not really had any medical background, the guy injected something into Tatay Jesus’ back. The ‘treatments’ would eventually become painful and Tatay Jesus didn’t return to the quack doctor but neither did he go back to the health center or seek help at the hospital. As the years passed, the lump grew. It has grown so big that today, some 40 years later, it already weighs 10kg. 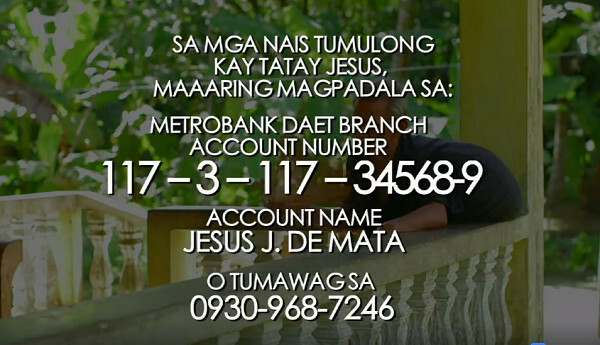 The lump has also affected Tatay Jesus’ life, making it harder for him to move. Even sitting down can be a chore because the cyst was too heavy. Sleeping is also difficult because he can only do so in one position. Thankfully, his story got featured on Kapuso Mo, Jessica Soho. He was brought to a doctor, a real one this time, for the lump to be checked. He underwent imaging and diagnostic tests. It was revealed that the cyst was not cancerous and it would be ‘easy’ to get it removed, the doctor said.